The mating rituals of hermit crabs can contain fighting over mates, picky females, restrictions due to size and incredible journeys to provide for their young. Their characteristic shells play a certain role in mating, as may their large right claws. Reproduction is through copulation, just like in other crustaceans. During reproduction, the males and females both partially remove their bodies from their shells to allow for copulation to take place. The male releases spermatophores to the female to fertilize the eggs. Copulation can take a few seconds to almost a minute. Once copulation is over, the crabs insert their bodies back into their shells. Like many other animals, choosing a mate can come down to several factors for hermit crabs. A University of Michigan Department of Biology study in 1987 closely watched the mating habits and effects of shell size and species. Larger males tend to reproduce with larger females, most likely because larger females carry more eggs. In some species, smaller males have been seen trying to reproduce with larger females, although copulation rarely takes place. Some of the unsuccessful courtships attempted by smaller males is in part due to interruptions by larger males. However, some of the largest males in the study group were unsuccessful at copulation, but they were successful at interrupting mating between the smaller males and females. It seems, in some species at least, that medium-large and medium-small males have the advantage. 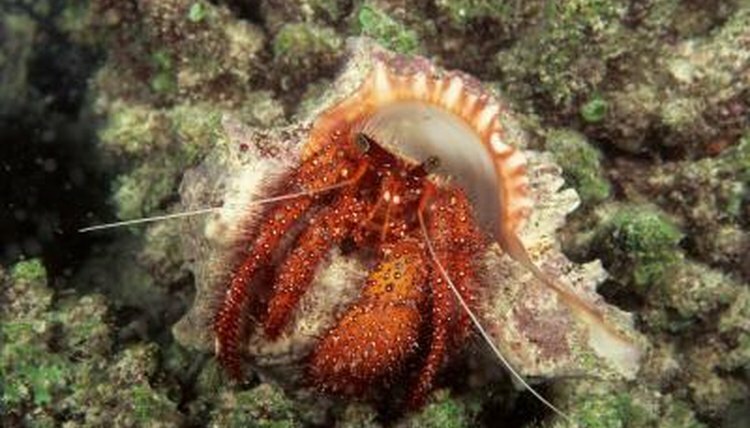 Like other land hermits, the Caribbean hermit crab makes great migrations from the forests to the shore during reproductive times. As they make their sometimes 3-mile trek to the ocean shore, they mate along the way. Females then carry their eggs as the larvae develop before releasing mature eggs into the ocean, where the saltwater causes the eggs to hatch and the larvae to release into the water. In some species, the males will join the females in wading into the water's edge, but not all. While both male and female hermit crabs display heterochely, having one claw dominantly larger than the other, males have distinctively larger claws than their female counterparts. The larger claws help in defending their territory and battling for a mate.